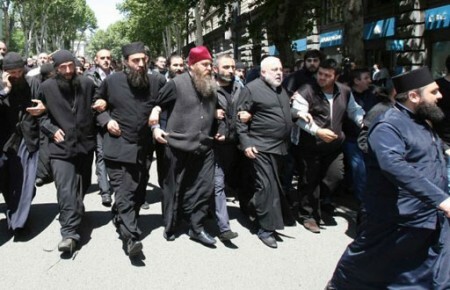 Thousands of anti-gay protesters, including Orthodox priests, occupied a central street in Georgia's capital Friday, with some threatening to lash with nettles any participant in a gay pride parade which was to take place there. Thousands of anti-gay protesters, including Orthodox priests, occupied a central street in Georgia’s capital Friday, with some threatening to lash with nettles any participant in a gay pride parade which was to take place there. 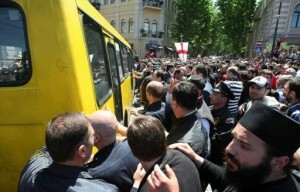 TBILISI, Georgia — Thousands of anti-gay protesters, including Orthodox priests, occupied a central street in Georgia’s capital Friday, with some threatening to lash with stinging nettles any participant in a gay pride rally planned in observation of the International Day Against Homophobia and Transphobia (IDAHOT). Police officers guard a gay activist who arrived for a gay pride rally to a bus to take her out of the city center. Anti-gay protesters try to attack a bus with gay activists who are being taken by the police from a gay pride rally out of the city centre. Police, however, failed to prevent scuffles, which resulted in 16 people getting injured, the ambulance service said. A number of protesters carrying bunches of stinging nettles threatened to use them on gay activists. They insist that homosexuality runs against Georgia’s traditional Orthodox Christian values. 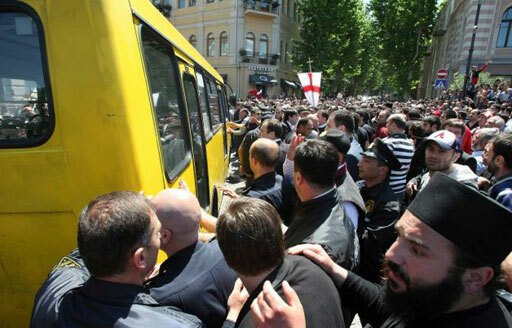 A gay rally in Tbilisi last year was also short-lived and ended in a scuffle. Georgia’s authorities had given the green light for the gay parade to take place, saying that all Georgian citizens, irrespective of their sexuality, are entitled to voice their views in public. Georgia’s human rights ombudsman, Uchi Nanuashvili, said it is “deplorable” that gay people’s constitutional rights were violated on Rustavi Street on Friday.